What will the project do? What are the projects goals? 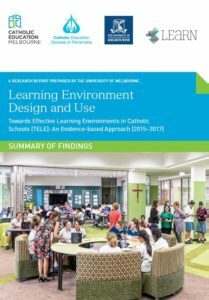 The Towards Effective Learning Environments in Catholic Schools: An Evidence based Approach (TELE) project (2015-2017) is one of the largest known studies to have evaluated the relationships between the built environment and the practices, activities and behaviours of school students and teachers. Set up as a collaborative research initiative between Catholic Education Melbourne (CEM), Catholic Education Office Parramatta (CEOP) and the Learning Environments Applied Research Network (LEaRN) at the University of Melbourne, the objective of the project was to develop an evidence base to inform both the design and pedagogical use of learning environments (school facilities) in Catholic Schools – as-well-as schools more widely. The Summary of Findings report can be found here. Evaluation fieldwork was conducted in 43 learning environments across 38 schools – primary and secondary – using LEaRN Evaluation Module 3 – Alignment of Pedagogy and Learning Environments. The findings of the project represent the opinions of 3782 students and 300 teachers about their day-to-day experience of learning and teaching in the learning environments found at their schools. The TELE project was led by Dr Benjamin Cleveland, with strategic advice on the design and conduct of the project from Associate Professor Wesley Imms. Dr Pippa Soccio expertly managed the day-to-day operation of the project as Research Manager. Research assistance was provided by Ms Roz Mountain. Innovative learning spaces: Catalysts/agents for change, or ‘just another fad’? In accordance with Australian Government policy, the Australian Research Council encourages the dissemination and exchange of public sector information provided on this website. You may use any of the material on this website for your personal, non-commercial use or use within your organisation for non-commercial purposes, provided that an appropriate acknowledgement is made (retaining this notice), and the material is not altered or subjected to derogatory treatment. The details of the relevant licence conditions are available on the Creative Commons website, as is the full legal code for the CC BY 3.0 AU license.